As always, these are my rough notes. Please let me know if you find any typos or corrections. Permission for photos and publication of my notes was requested from and granted by all of today’s speakers. Enjoy! Max and Bennett welcomed attendees to the conference, 13 years later and strong as ever. Max recognized the first-time attendees as well as those who have attended for ten years. He then welcomed and thanked all veterans on this Veteran’s Day and noted that yesterday was the 242nd anniversary of the Marine Corp. He became emotional as he remembered those who are no longer with us-Wayne Bates, Robert Griffeth, David Preston, David Powell, Terry Duhurst, Larry Rutledge, and Cynthia Wells. Bennett reviewed some housekeeping issues. Questions are taken in writing. There is an ISOGG gathering tonight and a meeting tomorrow morning. Those who have requested kits will have kits already bundled and waiting during the break. Bennett introduced the staff and noted that they are now a company of 140+ employees. 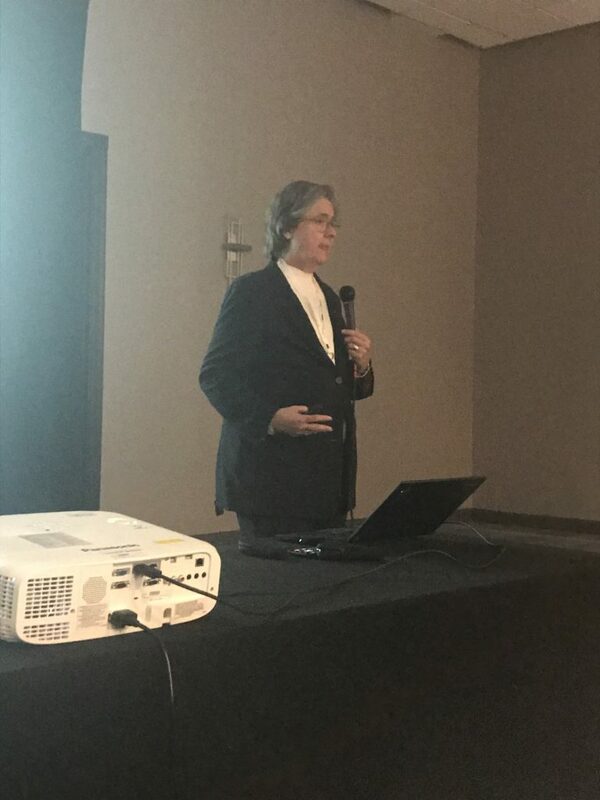 Bennett introduced Peter Sjolund, a DNA administrator from Sweden and director of the DNA Academy, who presented The Power of Mitochondrial DNA. Peter noted that 80% of people in Sweden who test use Family Tree DNA. During the past couple of years they’ve found a better place to get DNA from the petrous bone behind the ear. Every person in the room is a living family history book. One gram of DNA contains enough information to put it on CDs, it would take 1,000 billion CD records. Mitochondrial DNA is dismissed by a lot of people, but it’s a powerful tool and people just need to learn how to use it. Peter was able to trace his wife’s maternal line back to 1610. To confirm this line, she did mitochondrial DNA. At first she did not have matches but she eventually got some and Peter has used this information to confirm all of lines and link the descendants together. His wife is H52 haplogroup. The best way to use mitochondrial DNA is target testing. Find two female lines who descend from one woman and start there. People in Sweden are doing a lot of target testing. They have the Swedish Haplogroup Database where people are registering their lines and piece by piece, they are mapping relations back to the 1600s. Peter talked about the Great Mother of Dalecarlia. She had eleven children of her own and more children of her husband, so she took care of 18 total children. Two men who received the DNA from their mothers were both target tested and were H11b1. They matched and confirmed the lineage of this famous woman. The haplogroup C4a1c came from Sibertia to mid Sweden sometime before the 16th century. Some possible theories include the idea that Vikings may have taken a woman back from this area of Russia or that there was a connection to the reindeer of northern Sweden, who came from the same area. Mitochondrial DNA is the easiest to get from prehistoric remains. In Sweden they will have close to 100 skeletons results next year. This also helps to tell how they lived because archaelogists find them at sites where there is evidence about how they live. Peter shared a story of a man who wanted to know as much as possible. They traced his line back through Vikings, then through Germany to people moving around in wheeled chariots who were among the first to use horses and speak indo-european languages. Peter played a clip of the language that ancestors in Europe spoke in the beginning of the Bronze Age. Further back, the man’s line went to Ukraine 6,000 years ago. They lived in a Trapelia culture. Before that, they were in Yugoslavia. Small amulets were found that proved that these people had written language. The most fascinating ancestor was found 8,300 years ago in Northern Turkey. The layer that was found had a clay floor of a house that was burned and it’s hard. In the floor, there were two footprints. It’s a fascinating way to experience history, through your own DNA. A good way to start is to look at the website Ancestral Journeys. You can find lists of all of the skeletons they have analyzed. Peter noted that you can submit your mitochondrial DNA results and contribute to expanding the tree. Do this through GenBank via http://tinyurl.com/mtDNAtoGenbank. 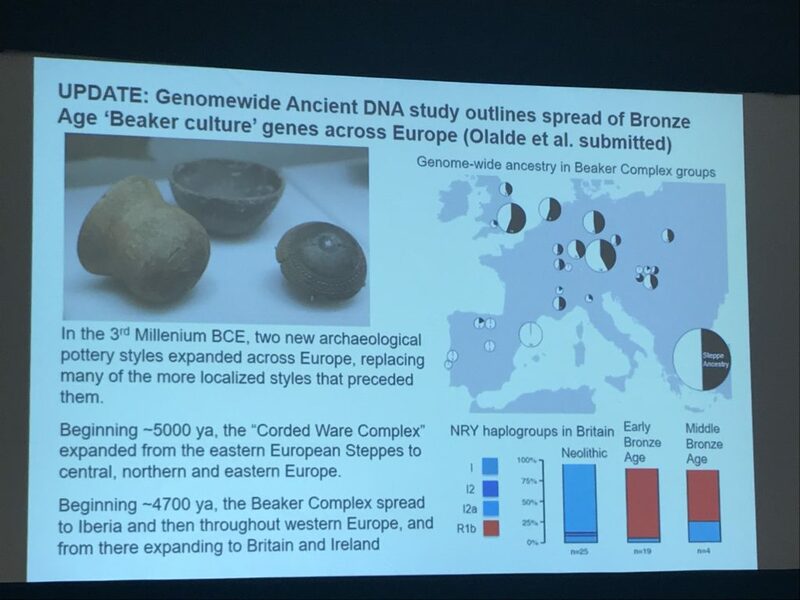 Peters says mtDNA is a great genealogy tool. Just learn to use it! In the Viking City of Birka, they have found a lot of houses and a lot of graves. It was a huge city in its time. One of those graves was a very, very rich grave of a Viking warrior. He was buried with a sword, arrows, shields, spear, two horses, and game pieces. They excavated it about 100 years ago but now they have DNA and they know that this man was a woman! Is this downloadable? 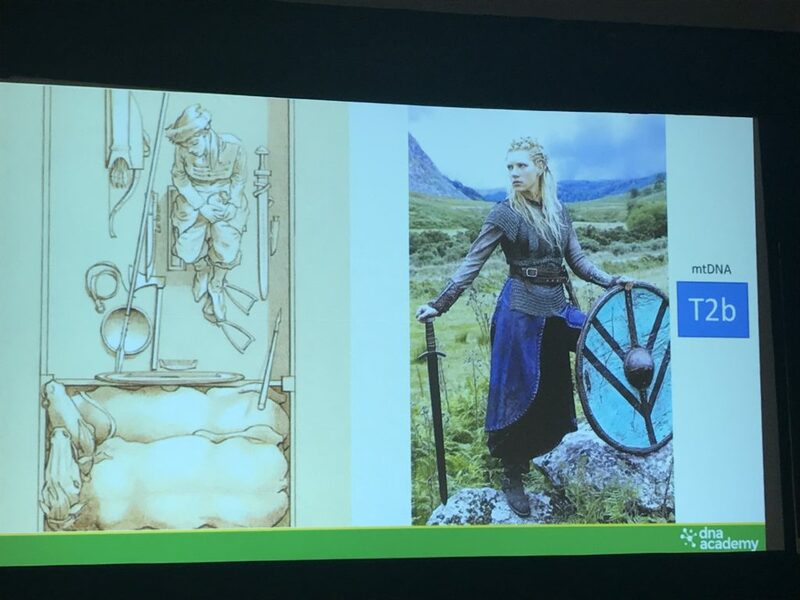 Peter did a similar presentation at Genetic Genealogy Ireland and it will be online soon. Where can we find info about ancient DNA and the paths? Ancestral Journeys is the best place to start. My mtDNA is U5 and was done very early. Do I need to retest to submit to GenBank? Yes, you need a full sequence to submit to GenBank. One of my female ancestors is not a direct line. Everyone in my group descends to her. How do I found someone? Start with that person and go toward living people. If she only had sons, there’s nothing you can do. What are other known Swedish haplogroups? U5, J, K, and T are the most common besides a lot of H groups. How do you address statistical chance that the mtDNA cousins are a coincidence? It’s tricky when it comes to mtDNA because mutations can happen at the same spot so you won’t see the mutations. The key is to see every mutation. You need to see the full sequence including the coding region, which FTDNA does not show by default. They have to be turned on. What is the mitochondrial distance? It’s how many mutations differ between you and your match. On average, a mtDNA mutation happens every 2,000 years but there are cases in Sweden with three mutations in two generations. [I wasn’t sure I heard this part correctly.] It’s tricky but the key is to have many tested and look at the geography. Trying to find parents of great-grandmother born in 1840 and have more than 20 FMS matches. Should we look at only GD of 1 or more? Look at all of them. There could be two or three mutations in that time. The mutations in the coding region are probably happening a long time ago but in HVR is more likely recent. Do you have mtDNA maps related to the parish maps in Sweden? That is what they’re doing with the Swedish Haplogroup Database. In a couple years time you can go into the parish and find hundreds of people living in a parish and their DNA. Max introduced Janine Cloud, the FTNDA Groups Project Manager since 2011. Before coming to the company, she was already involved in genealogy. She is a five generation Texan and a registered member of the Cherokee. Janine will talk about the guidelines for Group Administrators, a topic that is more important than you think and has very serious legal implications. It’s very important that Group Administrators follow guidelines and are careful. Janine said everything you really need to know we learned in kindergarten. What does this have to do with GAP guidelines? The principles are the same. Respect, compassion, integrity. Treat other people as if they were beloved family members. Stick together and communicate. Communication issues are the number one issue they deal with. Also, have fun but be nice. There are very seldom DNA emergencies but occasionally they are. Part of the Groups Project Team’s job is to enforce GAP guidelines. Some days that’s like trying to herd cats, or maybe sheep. Janine reviewed legal vs. ethical. Just because something is legal doesn’t mean it’s ethical. The number one complaint is that people don’t answer emails. It’s not illegal and it’s probably not unethical but it’s part of the job. Sometimes that means “I didn’t get the answer I wanted to my email.” Sometimes it is true that there was no response. If the members can’t reach you and FTDNA can’t reach you, they assume you can’t do the job, so be sure to update your email address. Other complaints include ordering additional tests without permission, joining to projects without permission, and publishing full info without permission. If you have a third-party website and put any more than what is visible on the FTNDA website, you should have written permission. Just because you CAN do something, doesn’t mean you SHOULD. If someone gives you permission and they change their mind, they have that right just like you would have that right. The GAP guidelines are designed to protect administrators, project members, the company, and testers. Contact them at groups@ftdna.com or groups@familytreedna.com or choose the GAP line option when you call the main FTDNA number. Cris Perez* Chris is moving to the QA team after this weekend. He handles complicated issues. One of my members left me a message. My FF message does not match my daughter. What do I tell her? How do I handle this with compassion? Call or write to the group’s project team. They go to the lab and make sure nothing was switched and make sure they didn’t make a mistake. You don’t necessarily have to do it but it might be better coming from someone at the company. Just because they’re not your biological family, they are still your family. The team can help you to communicate better. Can we change kit numbers and anonymize? No. The guidelines are a little buried and hard to find. Can you change that? They’re in the learning center and it says guidelines. There is a link. A new project application indicates that you read it. Even though people check six boxes to say they did them, people may still not be doing them. If you are a co-admin or taking over a project, this doesn’t happen so they’re working on a solution. If there is a problem with the kit, do you just send a new kit with no email? They don’t guarantee that an email goes out every time and even if it does, they can’t guarantee you get it. In general, there is an explanation in the kit. There is usually a letter that goes in with the kit. Is it improper to list a kit number on a third-party website? It shouldn’t be a problem if it’s only the kit number. What you need to think of your goal. What are you aiming to do by making certain information public? Once you know what you want to achieve, think about how to do it without giving the minimal amount of information that might identify someone in the records. Think about how to make it public without allowing a person to grab that information and make connections allowing him to know who the record belongs to. Keep this in mind before making anything public. If a project member dies and you’re given permission what do you do? Send permission that you have to them to keep on file. Make sure it is the executor of the estate and not another person who is not. Sometimes divorces on top of deaths or things like that can be sticky. I’m a co-admin and I assume the admin answers all the emails. How do I know if the admin really answers all the emails? Agree between the two of you what kind of emails each of you will answer. In Max and Bennett’s case, they make an agreement about which questions each of them answers. I’ve seen another admin post kit number matches. Is that ok? If you are listing matches who are not in your project, it’s dicey. Why do we allow private groups in GAP? There are two kinds of project groups—your family groups that cannot be seen and public groups. You never know what the agreement is with the admin who recruited them. In old cases where people were promised anonymity those are allowed to be kept private. Will FTDNA please be more insistent that people have beneficiaries? They could consider a promotion on that within the next year. Max said, “Do you mean a promotion like $5 off if you fill in a beneficiary?” Janine suggested that it would be a good campaign. My email address occasionally goes on the bounce list. I recommend someone check that? Janine said that would be too much for them to keep up with. If you notice you are not getting something you expect, check with them. They rarely have issues with gmail. It’s usually only yahoo or att that have problems. Does beneficiary override will? Max said until they are not informed that there is a different kind of designation in the will or trust, the beneficiary designation on the page is the one in effect. From the legal standpoint, it probably depends on which came first. Is a permission form ok if it’s not notarized but witnessed by two other individuals? Janine says she would personally think it’s ok but she’s not sure how that would hold up in court. Can there be some method to identify that a kit has passed to a beneficiary? This is coming. Bennett introduced Frank Billingsly, Houston Channel 2 weatherman and author of Swabbed & Found. Frank had a eureka moment and wrote a book about it. Frank is normally talking about hurricanes. Frank was adopted at four months old. He swabbed in 2013. Frank has a wonderful family support unit and loves them dearly. He also has a very strong work team unit. He also has a sister who was adopted from a home for unwed mothers. She found out that her mother had died in 1977 but her father had never known anything about her. He had two teenage girls and he didn’t want anything to do with her. Her own half-sister lived in Houston and watched Frank on tv. This gave her closure. Frank was 53 when he heard about DNA testing and he is 57 now. He worked with Family Tree DNA and had a tour. People wondered why he even cared. There were multiple reasons and that’s probably not necessary to explain to genealogists. In his case, he went to school to be a writer. He had an internship and at the end, they asked him if he wanted to be a weatherman in 1982. The Weather Channel started in 1981 and left a need for weathermen. Journalist + scientist = very curious! When he tested, he didn’t know if it was going to work or if people would be alive, remember him, and want to know him. Morgan from FTDNA explained DNA inheritance to Frank using the card analogy. Frank’s closest match was Alicia. They probably share a 5th great grandmother. Frank shared DNA with both her mom and dad but they did not share DNA with each other. Frank tested at FTDNA and then waited and waited. Quality control takes a while. Then he hit a jackpot! He matched 28 out of 36 people with the name Hensley on his Y-DNA. From his autosomal DNA, he’s a third cousin to Janine at Family Tree DNA. He also matched a man named Frank Billingsly who used to live in Katy, TX and who watched Frank on TV. He also matched Jeannie, an 81-year-old lady who had written eleven books on genealogy, had an AOL account, and a Facebook page! She happened to be wearing a name tag that showed that she was Mormon. Frank sent her an email and got a response in about seven minutes. He said he thought they were first cousins once removed and they shared the X. It looked like she was a first cousin to her mother. Jeannie said Frank was not on the Mormon side and she knew all the people on that line. She told him to look on her dad’s side. Frank began to look at her dad’s side for cousins. Arkansas parents do a lot more than farm, they make farmers by the dozens! Sometimes there were 14, 15, or 16 kids! Meanwhile, Frank sent for his non-ID and it took 60 days. Angie Bush was helping. It turns out he was looking for the wrong grandparents because they were double-cousins. He wasn’t really first cousins once removed but it looked that way due to the duplicate marriages. His biological mother was really a double second cousin. Alicia kept digging and eventually found a candidate for grandmother, with a gravestone Gearldine Fisher with a year that was probably not correct. This gravestone maker probably did not read the information correctly. The non-ID said that she had three different children by three different men and never married any of them. Alicia told him not to believe non-ID. They went digging and she was actually married to a man who went off to war and never came back. She married another man and had a son and daughter and died in childbirth with the daughter while married to the Tankersley. Alicia messaged at 2:00 a.m. and said she found an aunt. Frank texted her the next morning. She texted back 45 minutes later and she basically said, “I think I heard something about this. I’m on my way to lunch. Let’s talk later.” They talked later. Then he got a match to Safari Bill. They are first cousins once removed—or are they? Bill had two aunts, Betty and Charlotte. Charlotte was very involved with church, never married, and not a likely candidate but Aunt Betty was a riverboat singer. She had one son. He was checking out one base and another and on 22 June 1960, Frank was born. He was adopted 28 October 1960. He doesn’t know where he was for the first four years. Remember to leave a book review on Amazon.com! Bennett commented that he thinks DNA testing will become as ubiquitous as the cell phone. It will transform from a genetic survey to genetic census. Did you do mitochondrial? Yes, but it’s not really the best for adoptees. Frank has a lot of Swedish names in his mitochondrial DNA. As an aside, Frank commented that they have found Viking remains in the Mississippi River. 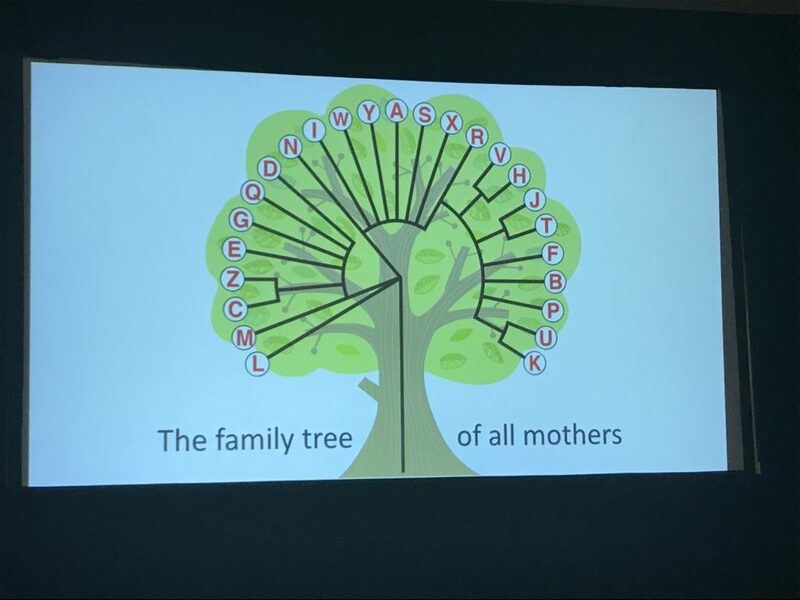 After a wonderful lunch buffet, I attended the breakout session with Judy Russell entitled “A Matter of Standards: DNA and the Genealogical Proof Standard.” We want to make sure we “do genealogy right” and make sure the information we are putting out there is accurate. There are some unique aspects about DNA evidence and we need some additional learning to use DNA and use it effectively. This is mainstream genealogical evidence and we need to use it in the same ways we’re going to use anything in genealogical research. Make sure work is thoroughly researched, source cited and that it’s been compared and contrasted with other evidence collected on the topic, and conflicts resolved. Judy introduced the book Genealogy Standards by the Board for Certification of Genealogists. She explained that this book is for everyone—everyone wants to follow genealogy’s best practices. The system is called the Genealogical Proof Standard, made up of five interrelated components. Reasonably exhaustive research means that we look at a wide range of high-quality sources because we want to minimize the chance that the one thing we haven’t looked at is going to blow up the entire theory. It’s a reasonable effort to look at all of the evidence that could point us in the direction of that conclusion. If we have missed something, it’s a landmine. Always think about whether genetic data can take us to any part of the conclusion. DNA doesn’t always work because sometimes it’s not available or a potential tester is not willing. Full source citations are not always fun but we need them. Elizabeth Shown Mills has a Quicksheet to help you understand and she also has a free website to help people understand. She talks about the five rules for citation in Quick Lesson 21: Citing DNA Evidence: Five Rules. There’s a difference between evidence and a citation. DNA is just another form of evidence. Citations are created to support an assertion. The format of a citation depends upon the physical qualities of the source. Source citations often have to carry explanations. There is one unbreakable rule. We should never blindly trust any assertion by anyone. Always trust but verify. Analysis & correlation is key. DNA must be analyzed and correlated with other information. DNA by itself does not prove anything. There is no DNA evidence that can 100% answer a question of relationship. Judy gave an example of a parent/child match where the parent didn’t match the child at all due to a bone marrow transplant. The parent was a twin so the child appeared to be a child of the aunt. It is critical for us to note tree depth because what conclusions we can draw depend on how good the tree information is for both parties. We have a confidence level that is different depending on how robust the trees are. We need to know what we are comparing. A risk that we run is wanting a result and being willing to overlook some of the limitations of the data that we are looking at. One of the biggest limitations is segment size. From Blaine Bettinger’s project, if the segment is from a non-endogamous population, and the segment size is over 15 cM, there’s in excess of a 99% chance that the segment is also going to be present in the parents. With segment sizes between 7-10 cM, there’s about a 40% chance that neither of your parents will have it, meaning that either you’re a false positive or they’re a false negative. Below 7 cM, the vast majority won’t be shared by either parent. Blaine refers to these as poison m&ms. This doesn’t mean don’t use them. It means use caution. It’s not going to be very long before we’ll know enough to be able to perhaps use small segments more effectively. Sound written conclusion—we must write it up! Even if that means sending out an email and writing to everyone on your match list and talk about how you’re related. If you don’t like that, try writing to them with pen and paper. We never get better, finalize our research, or find the documents that our cousins have if we don’t get it out there. Doing the writing is part of following the best practices of our field. 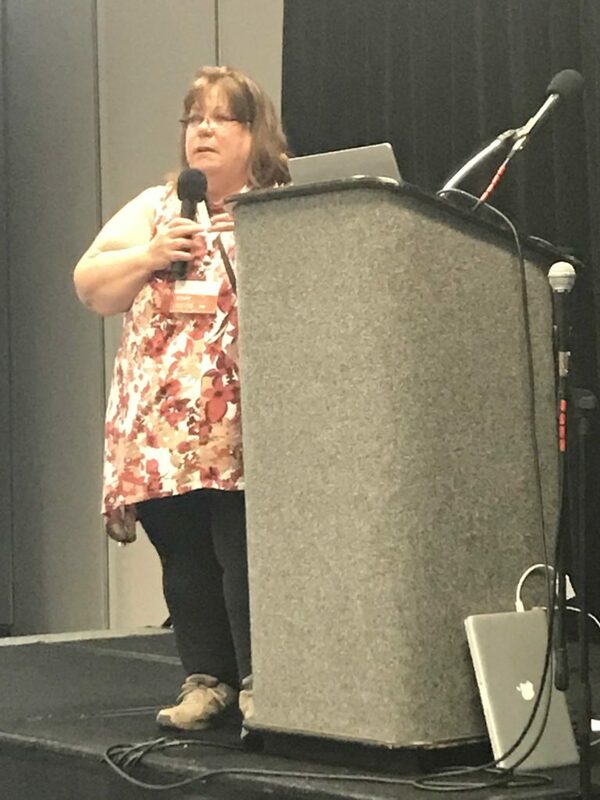 There are Genetic Genealogy Standards and Genealogical Standards for Sharing information with others by the National Genealogical Society and we should follow them. All genealogical evidence is a matter of standards. 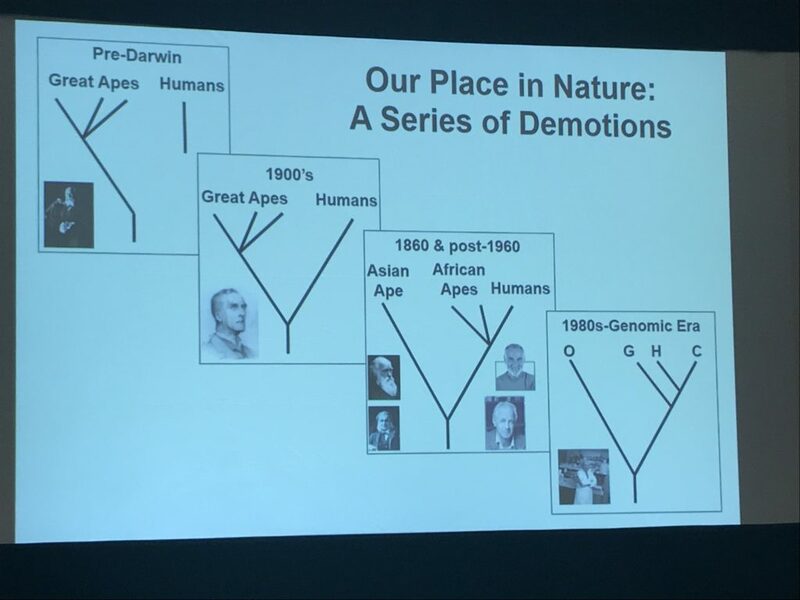 The next breakout I attended was “How to Build a Mutation History Tree for the Larger Groups in Your Surname Project” with Maurice Gleeson. 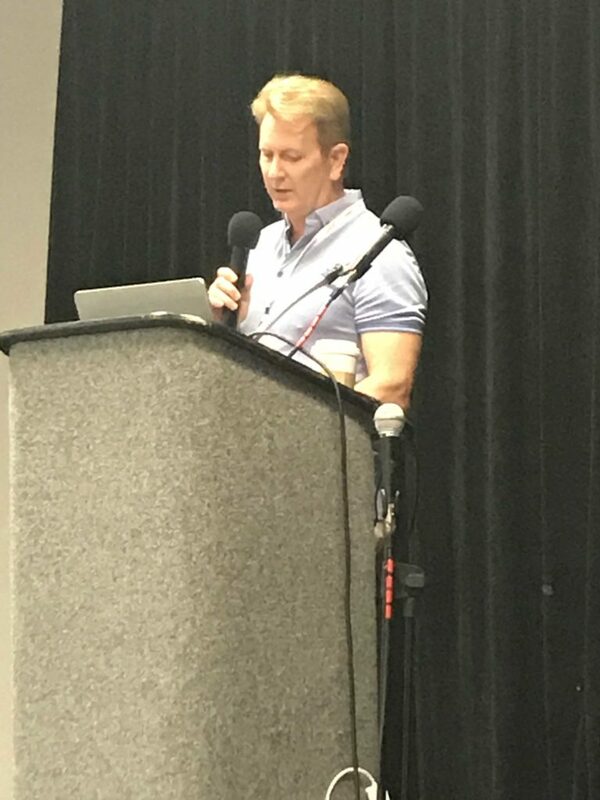 Maurice noted that this talk is being recorded and will be on his YouTube channel. There is also information on The Gleason /Gleeson DNA Project blog. For a lot of us, our trees end and our DNA markers can take us farther back in time with a method of combining SNP and STR markers with no genealogies. Irish research tends to run out in the 1800s, whereas British research that can often go to 1600s. This is where the DNA markers can fill a gap. Dave Vance created a SAPP Programme. He gave a talk in Dublin at GGI and it’s available on Facebook. It will be uploaded to the GGI Youtube channel within the next couple of weeks. Why do it? There are many benefits to both the project and its members. It’s a nice visual summary of a large amount of project data. It helps communication with project members. It allows members to see how they are all related to all other members. It also gives a clear view of how the surname has evolved over time. That can be interesting, especially if you have surname variants. It defines the branching points over time, shows how close or distant the various branches are, and gives a better estimate of TMRCA of branches than TiP alone. It also probably gives better dates for the MRCA for the entire group. It’s also a useful visualization to add to your project publicity. The visualization method has four methods. The first step is to identify the subgroups. Maurice prefers World Families over FTNDA to look at them. The colors on World Families helps with the visualization of lineages. Maurice tends to ignore CDYa and CDYb. Each genetic group within the project will have a unique pattern to help to define that the person belongs to that group. He then moved all of these results to an Excel file and to identify the subgroups, first group those people who you know to be related to each other. Then look at SNP markers and then those who are grouped tightly by genetic distance. The fourth criteria is to look at the unique STR pattern for subgroups. The next step is to place them on the tree. There are several floating subgroups and they need an anchor and they need to be placed correctly relative to each other. The best anchor is the haplotype of the nearest major subclade. For the Gleeson Lineage II, that is Z255 Modal Haplotype. Those were extracted from the R-L21 Haplogroup Project. The Z255 haplotype is about 2,000 years old. This is really a best fit situation—the closest you’ll be able to get with the information available. You then identify single mutations specific to individuals and set them aside. This helps define the branching structure within the subgroups. When inspecting each subgroup marker by marker, does it differ from Z255? What configuration of mutations gives the least number of steps? Once you’ve worked it out for yourself using this visualization method, you can then check it against Dave Vance’s SAPP Programme. Create a text file of your results and upload it under SAPP Program Input. It creates a spider diagram. It’s more than Fluxus. It also allows SNP data. You can put in ancestors into the program. It produces a tree and dates the branches. It’s a great way of checking the visualization method. There are four things to date the branches in your tree. You can use pedigrees if you have them, TiP tool, SNP data, and the SAPP tool. Dating using pedigrees is the most accurate way of dating a branching point but most do not go back far enough. When using the TiP report, it gives a range that’s really too wide. The SAPP Programme is based on Ken Nordtvedt’s Interclade Ageing Methodology. It uses least-squares analysis using STR differences and mutation rates. It calculates the likely TMRCA ages at each branching point on the tree. It is important to note that everything here is accurate statistically but is genealogically inexact. So which estimate is the best one? The one that best fits your preconceived ideas! Why? Because that’s what we do as human beings. We are naturally biased to what we want to believe. Truly, the pedigree method is the most accurate. The others are statistically accurate but not genealogically exact and never will be. Dating is difficult and will just give you ballpark figures. 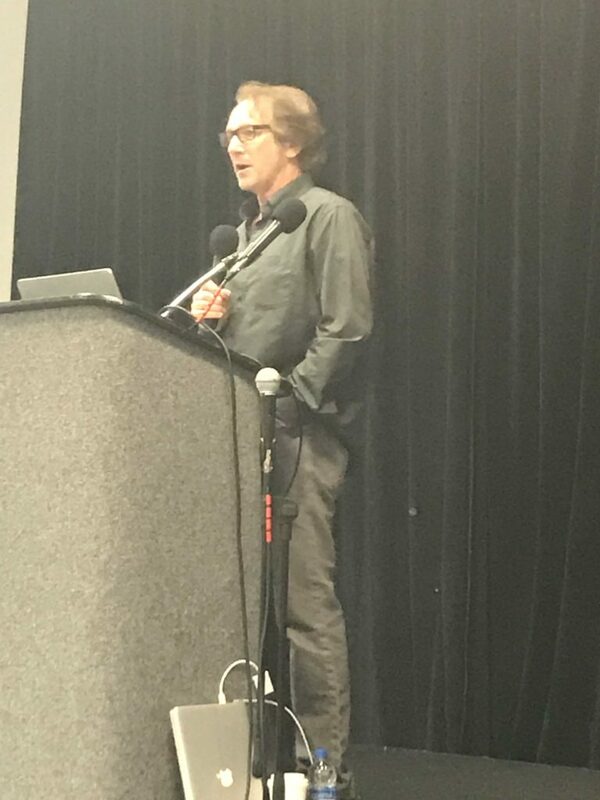 Dr. Michael Hammer presented “Top 10: Human Evolutionary Genomics: The most enduring discoveries over the last decade…” Dr. Hammer did a review of updates from the last couple of years. Ancient DNA is one of the biggest things to come from evolutionary DNA. There are incredible burial sites all over Europe that are giving us information. Anatomically modern hunter-gatherers first migrated into Europe about ~45 kya from Africa through the levant. The second major infusion of people comes with the expansion of agriculture—also from the Levant. After 7000 years ago, he Steppe component entered the broader European gene pool after Neolitic. Ancient DNA supports the recent spread of Haplogroup R1b across western Europe. R1b was the last of the entries into Europe, coming in with the people from the Steppes. Dr. Hammer told us of an update as shown in the slide below. 10. Humans are most closely related to Chimpanzees. The latest genome sequence data shows >98% of sequence shared with a chimpanzee. 9. Humans are genetically less variable than most other great apes. A pair of random humans are expected to differ in 1/1000 nucleotides. 8. There is a low level of differentiation between human groups. Differences between human populations account for only ~15% of our species’ genetic diversity. Approximately ~85% of variation is found within populations. We have about as much variation as a Kenyan waterbuck or impala, where a chimp subspecies have about 32% genetic differentiation. 7. The Human Genome Project ‘Disproves Concept of Race.’ Craig Venter said, “The concept of race has no genetic or scientific basis.” Bill Clinton said, “What it means is that modern science has confirmed what we first learned from ancient faiths, the most important fact of life on this earth is our common humanity.” This was not accepted by all people. Neil Risch at UCSF said that “race is helpful for understanding ethnic difference in disease and response to drugs.” This was published in the New England Journal of Medicine. There’s a longtime question about race vs. no race. Dr. Hammer showed some photos and asked people to attempt to group people based on their photos. Most people did not correctly guess the origins. 6. 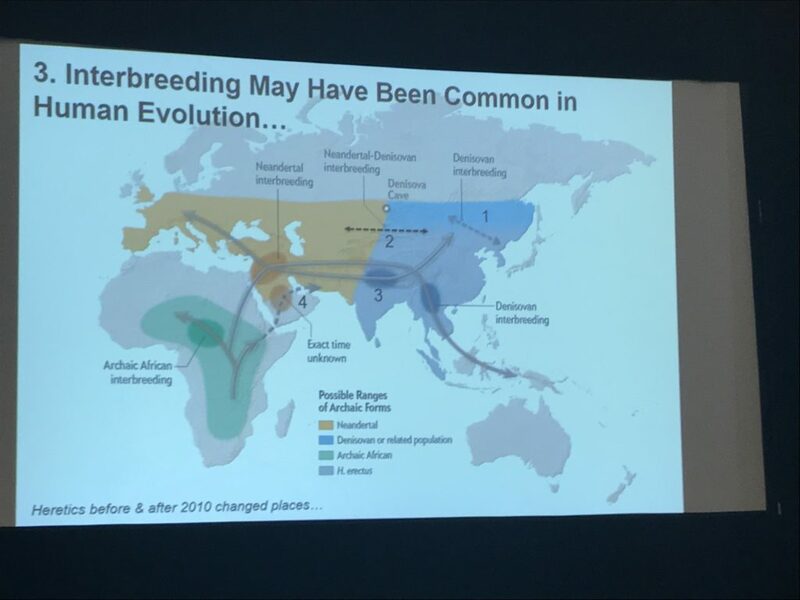 Human Genetic Diversity is clinal. There is a limited degree of differentiation among human populations. When individuals are sampled homogeneously from around the globe, clusters begin to merge. As you move to the extremities, you might be able to classify. 5. Positive natural selection increases differentiation for a small proportion of genes. A single SNP at SLC24A5 locus on chromosome 15 explains 25-38% of pigmentation variation between Europeans and W. Africans. Skin pigmentation is highly correlated with ultraviolet radiation. There are high levels of skin color genetic variation within Africa. 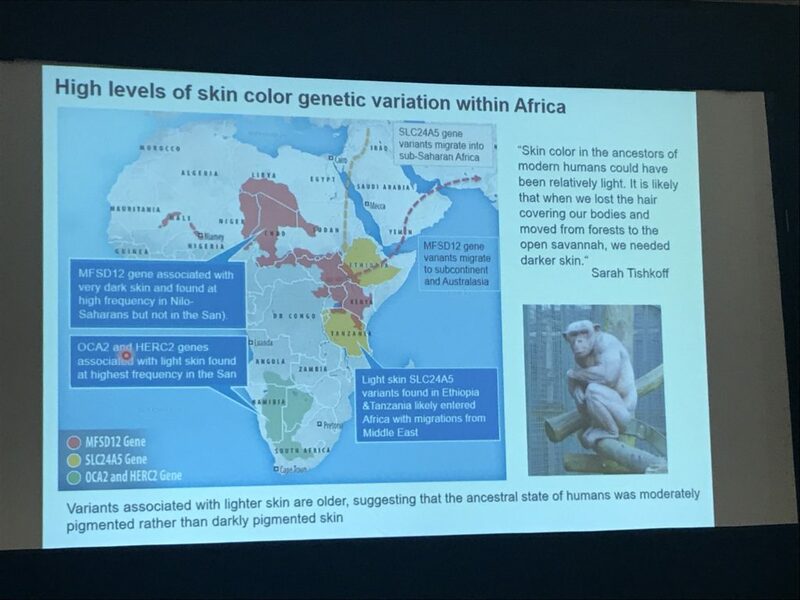 A recent paper by Sarah Tiskkoff sampled with a method like family finder and used a spectrometer to determine skin color. 3. A sequence influences how genes are turned on or off in modern humans. The effects on gene expression likely contribute to traits such as height and susceptibility to schizophrenia or lupus, depression, addiction to tobacco, hypercoagulation, malnutrition, urinary tract disorders, and actinic keratosis. 2. Explosive human population growth resulted in an excess of rare (deleterious) genetic variants. Our population expanded 1000-fold over the past 400 generations. It skews the pattern of genetic variation and increases the proportion of rare variants (5 times higher than expected.) The burden of private mutations for each individual is greatly increased. About 75% of SNPs arose within the past 5,000 years. Roughly 100 billion new mutations arise each generation in the entire population. A small percentage may be beneficial. It’s estimated that >15% are potentially harmful. Fathers pass on more new mutations than mothers. The number of de novo mutations a father passes on to his children is highly correlated with his age at the time of conception. The male germ line has many more cell divisions, or DNA replications. The ratio of male:female cell divisions at 25 years is ~10.3. James Crow said, “The greatest mutational health hazard to the human genome is fertile older males.” Women pass on about 14 new mutations to their child and men pass on the rest. In summary, we are (mostly) modern Africans. We have a little archaic DNA in our system that may not have come from Africa. There is continuous variation over the whole world and no sharp boundaries between classicly defined races. There is a correlation between UVR radiation and skin color. Every genome is a mosaic with segments of different histories carried in the record. The honorable mention is that more women than men have contributed their DNA. Factors include intra-sexual selection and the typical mammalian mating system is polygynous. From a biological standpoint, we are a different subspecies from Neanderthals. Are there more de novo mutations now? The rate is probably pretty constant over time but because the population is growing, they are staying. If the population declined, a lot of them would drop. Are the Bell Beakers associated with the Celts? They must have a lot of Steppe ancestry. Human genome 99.9% identical across the globe. If you try to divide that variation into groups, how much of that differentiation is partitioned. Will the slides be available? Yes, if Bennett and Max will share them. A question about the Basque. We don’t quite understand the Basque at this point. Where does ET figure into all this? Could a higher Y-STR mutation rate be related to the fact that they are older fathers? Sure, anything that’s replication dependant would also be accelerated in older men. You would need many families to test that hypothesis. Comment: Every year I look forward to Michael’s interesting presentation. Thank you for continuing to meet with us each year. 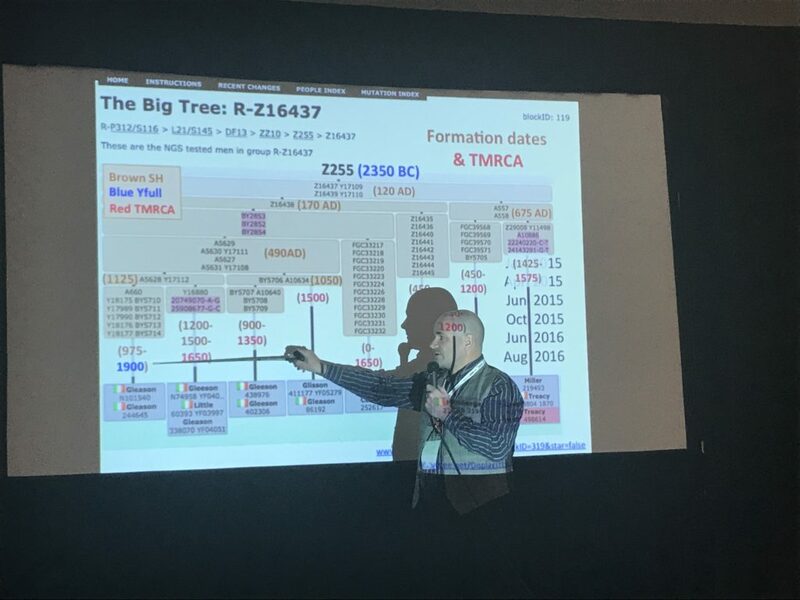 Next Jim Brewster presented “Y-Haplotree and SNP Pack Update.” Jim showed a Y Chromosome Consortium Tree from 2002. He then shared the R Haplotree from 2010 and it fit about four screenshots. Today the tree is massive and takes up many screens of trees. The B tree at this time last year had 13 branches with less than 100 trees and no Big Y tests. Now there are 13 branches, over 2,700 SNPS, and has incorporated 82 Big Y tests. Jim shared the overall number of SNPs on the Halpotree as presented by Alice Fairhurst in 2013. Then they introduced the Big Y. If you are interested in adding a new SNP to the tree, you can submit it. SNP packs are carefully designed panels of SNPs that are relevant and encompassing to a specific group (M343, L21, etc.). This is a cost efficient method to move a tester down the tree. In 2016 there were 96 active panels and there are now 106 active panels with 10 more in production and significant updates to existing packs. There are 9 haplogroups. With all the new SNPs discovered, how close to our time and to our genealogical research are we? Bennett said on his Greenspan line, he could not be further than about 200 or 225 years ago. He knows this due to Jewish naming patterns. This will become universal. Michael Sager added that the Big Y is going to take you as close in time as your closest relative who has tested. 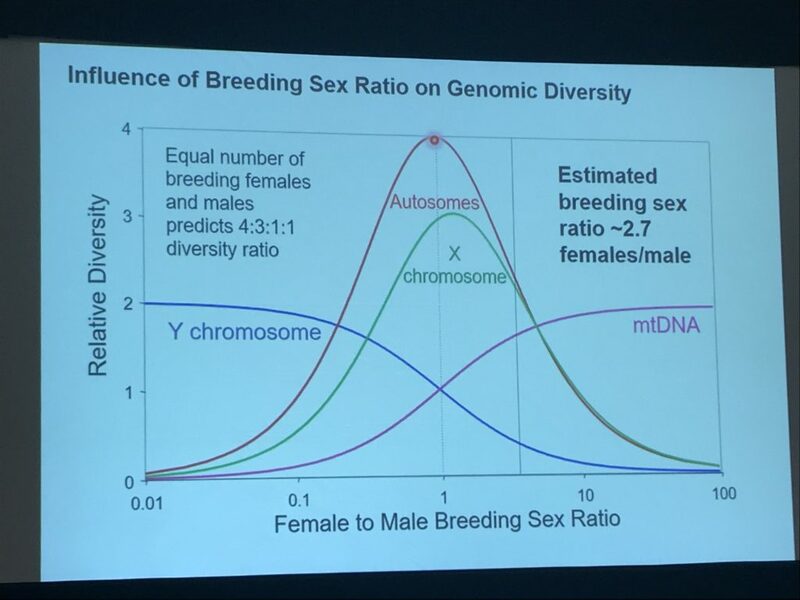 Think of the individual mutations that are discovered as actual men. Why does FTDNA continue to offer SNP packs to Big Y customers? Big Y does not sequence every region of the Y chromosome. Some admins take a different approach to SNP packs and will target SNPs that are more difficult to place on the phylogenetic tree because they are not covered by Big Y. They don’t want to exclude people and some of the SNP packs are getting down to where they have private mutations. Big Y customers like to see their mutations on it. What and how are individual SNP pack testing determined? Don’t understand the question. Comment: FTDNA haplotree is not accurate and some terminal SNPs are not correctly placed on the tree. Michael said please let him know and he will look at it and correct if necessary. What is the timeframe for SNP pack updates? They are trying not to target one specific group and stay on them. As the need becomes apparent they get to those. It depends on how outdated it is. For a custom SNP panel, is there a number of potential panels? They’re known SNPs so the process of adding SNPs to the tree, you have two or more people who test for that variant, then it can be included in the tree. The development of packs is based on the known tree. How many years will it be until all terminal SNPs are private SNPs? I don’t know. How long before all clade defining SNPs are found? When every person alive was tested and daughtering out is very common so never. Also, new ones are being born. We’ll keep having mutations. Comment: FTDNA does not seem to use SNP pack results for anything and only Big Y results are only used to extend the tree. Michael said let them know. They are more than happy to do it. They are putting out Big Y and SNP pack results at such a pace that it’s hard to keep up with. Feel free to nudge. Every single batch of SNP packs come in, he is breaking blocks on the tree. Why is triangulation and ICW a violation of privacy? It’s not. The Triangulator used a few weeks ago is questionable. What happens to orphan projects? Terry Barton runs World Families. Orphan projects are taken on by Terry. He has developed a system to manage many projects at once. He does it really well. Terry mentioned that he’d love to have a volunteer for every project. Is there a paper from FTDNA that explains how phasing and buckets are done? There is an internal document, yes. Did FTDNA validate the matches on the same segment? Yes. Beyond that, there are things that are company confidential and private. Can you identify a beneficiary as their name per stirpes so that each of their children can have access? If it’s cogent, they can take it under consideration. Is there any possibility that FTDNA will offer phone coverage on weekends? Max joked that they could raise the test price. Can we learn about project managers in our city so that we can meet? ISOGG might help or maybe they can help also. Will FTDNA provide an option to allow customers to say that it’s ok for others to know who they match? This is not yes or no but they have to address with senior management and attorneys. It gets into genetic snowsnakes, the things that hide in moguls on ski runs and always trip up skiers. There is a terrible litigiousness in our society. If there are things people want that are simple and easy that could potentially end up with lawyers drooling, they’ll have to err on the side of caution. Does FTDNA or an admin have permissions checklist to use with a new or existing tester? This question might be asking them to transform the guidelines into a checklist. What percentage of FTDNA mitochondrial tests are HVR1 and 2 vs. FMS? About 80% are now getting FMS vs. HVR1 and 2. What does publishing full info include—specific examples? It does not need to be full info. It’s enough to publish something that can identify a person and that’s what you cannot do. Before publishing anything, think to yourself is this information enough to make someone known. First name along with kit number is too much. They can go to the public project page, see the pedigree, see the results of the person. What are the legal and ethical implications of testing infants and children? You need to be the legal person with the legal custody of that child in order to get that child tested. If you are not, then get written consent. Max is not an attorney but that seems correct. To anonymize works for Y-DNA but under FF, someone can figure out your identity even with a fake name on the kit. There is no anonymity with autosomal. Some Y-DNA projects will not accept matches with a different surname. How can we get them to accept adoptees and others with different surnames? Communicate with the admin and explain the situation. There shouldn’t be any impediment. When will autosomal be added as a third tab to DNA results menu and what might be on it? Elliott doesn’t understand what third tab means. Find him to talk about it. Could the choice for default privacy settings be more transparent to testers and be replaced by clear options? They can look at it. Can the number of generations required for skin color change be roughly estimated? Mike Hammer said yes but they’d have to make certain assumptions about the size of the population and the selection coefficient. If something has a strong adaptive advantage, it could be calculated with population genetic theory. Very good question. With the Wayback Machine, once published means the beneficiaries of data have little say or not. Once you put anything on the internet, Google and Bing have it. Anything that’s public in general is public. Deceased testers – can you do PCR to amplify the sample and preserve it for future testing? It’s actually the opposite. They’d want to keep it in the vial with the lysis buffer that they’ve been using for 18 years. Keep it in that state for as long as possible when really good single cell sequencing technology would be available and from a small amount of DNA what today they have to use with the PCR process. How long until that happens? Mike Hammer said don’t know. Sometime in the future. Stay healthy. Question for Peter about H4a1a1a. Peter said it is based on how closely related Finland and Sweden are. They are very close and it’s hard to say anything about this. Thanks so much Jennifer for this detailed notes. I was unable to attend this year, and my co-administrator shared your link!